A diagnosis of any serious medical condition is scary, but an Alzheimer’s diagnosis can be especially terrifying. Alzheimer’s is progressive and incurable, but it is difficult to tell how fast the dementia will progress. Your future and the future of your loved ones becomes uncertain after an Alzheimer’s diagnosis, which is a difficult thing to endure. While you cannot solve the problem of a diagnosis of Alzheimer’s, you can regain control of your own destiny. You can do this by working with DeBruyckere Law Offices to make advanced plans for your future. Why is Alzheimer’s planning important? What should be part of Alzheimer’s planning? How can an Alzheimer’s planning lawyer help you? With an Alzheimer’s diagnosis comes the possibility of future incapacity. At some point, a patient with Alzheimer’s will become unable to make or communicate decisions about important things like medical treatment. Managing one’s own assets will become impossible as the condition progresses, and the Alzheimer’s patient will no longer be able to enter into contracts or create a will. The patient is also likely to become unable to live independently and will need nursing home care. For all of these reasons, making an advanced plan becomes essential. If steps are not taken to determine where the patient will live, how care will be paid for, and who will manage assets, the patient will lose control over these decisions. Family members could also be forced to go through legal proceedings to secure guardianship, and could end up fighting over what care the patient would have wanted or what happens to assets. Everyone is better off if advanced plans are made by the patient while he is still able. Incapacity planning: Living trusts, living wills and powers of attorney are used by patients to make advanced decisions on medical care and on asset management. These tools allow families to avoid guardianship proceedings and make it possible for patients to maintain a level of autonomy by choosing who will act for them. Nursing home planning: You want to do research in advance to find an appropriate nursing home care facility that the patient will move to when the time is right. Medicaid planning: Medicaid can provide coverage for nursing home care when most insurance, including Medicare, will not pay. Medicaid covers you only if you have limited financial resources, so you will either need to spend down assets to qualify or will need to work with an attorney to make a plan to protect your assets. Legacy planning: A comprehensive estate plan should be created, incorporating a last will, trusts, and other tools to determine what will happen to assets when the Alzheimer’s patient passes away. Making an estate plan is important while the patient is still of sound mind, otherwise default intestacy law will apply. Your Alzheimer’s planning lawyer can help you to understand what specific steps you need to take and how to protect your future by making effective use of legal tools. An Alzheimer’s planning lawyer can provide you with invaluable assistance in taking control of an uncertain future after a frightening diagnosis. 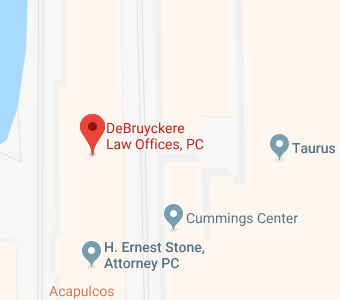 At DeBruyckere Law Offices, our legal team is compassionate, knowledgeable, and understanding. We work with you to create a road map for addressing all of the issues that an Alzheimer’s diagnosis can raise. We then help you to make the smart, informed choices that you must make in order to deal proactively with your diagnosis. Finally, we assist you in making full use of all available legal tools that allow you to secure your legacy and maintain as much autonomy as possible through the rest of your life. Our legal team services Nashua and Londonderry, New Hampshire as well as in Beverly, North Andover, and Woburn, Massachusetts. To find out more about the ways in which we can help you, give us a call or contact us online today.